If you want the quickest, most convenient and most flexible way to get from Sofia airport to VARNA, BulgariaTransport.com offers door to door PRIVATE TRANSFER service directly to your accommodation at lowest local rates. Prices for private transfers from Sofia Airport to destinations such as Varna start at 209€ each way for the vehicle, when there are eight people travelling , which works out at less than 27€ each for a group of eight. Private return transfers for one to four passengers cost just 165€ per vehicle each way. Which works out at less than 42€ per person for a family of 4. 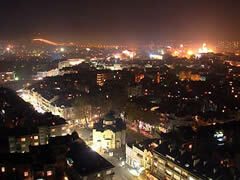 Varna is the largest city in Northern Bulgaria and on the Bulgarian Black Sea coast. It is a seaport with a population of 350 thousand citizens. 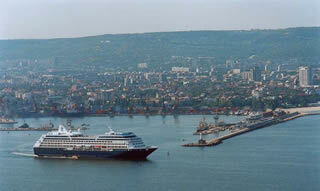 It is often referred to as 'the marine capital of Bulgaria'. Varna is a big cultural centre with a developed marine tourism and it is a starting point for many resorts on the Northern Black Sea coast. A lot of cultural events take place in Varna, such as the International Theatre Festival 'Varna Summer', the International Music Festival, the International Ballet Competition, the International Jazz Festival, the International Film Festival 'Love is Folly', the International Folk Festival, The Week of the Sea, etc. 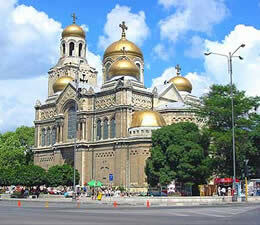 The oldest gold treasure in the world called Varna culture is kept in the Historical Museum - Varna. It is known that on the coast of the Varna Bay, where the oldest part of the city is situated now, there used to be the Odessus fortress founded in 6th c. BC (around 570 BC) near to an old Thracian settlement in Varna region. After the division of the Roman empire in 395 the city was included into the East Roman Empire, known as Byzantium. Regardless who the rulers of the fortress were, the city had always been independent, with a developed culture, trade and crafts and it had traditions in minting coins. Varna Eneolithic Necropolis was found in 1972 during construction works. It has been dated to 4200 BC. The oldest gold treasure in human history was found there, as well as other objects made of silver, copper, bronze, flint and clay. Varna culture or Eneolithic Varna culture at Varna Bay is a culture dated to the end of the Copper Age (4400 – 4100 BC) existing in Northern Bulgaria in this period. It is characterized by its fine ceramics with shiny polished surface probably achieved with a potter's wheel and rich graves. The most impressive monument is Varna necropolis and its Neolithic treasure.